Electric cooperative members across the state have saved millions of dollars by allowing their generation supplier, Buckeye Power, to control their use of electricity at certain times through Peak Management. Electricity cost is highest when it’s most needed – less than one percent of the hours in a year. Peak demand typically occurs in the mornings and evenings on a few of the most hot and humid summer days (between 4 and 10 p.m.) and a few really cold and windy winter days (between 6 and 10 a.m. and 5 and 9 p.m.). The maximum or “peak” amount of electricity used determines Pioneer's future costs of power. When the peak goes up, so does the cost. By reducing the demand for electricity created by electric water heaters, home-heating systems and central air-conditioning systems of our members, the cooperative reduces its costs for power. So, when you volunteer to participate in a Peak Management program, you’re joining thousands of other electric cooperative members across Ohio to control use of electricity and save money. Summer peaks are currently our biggest concern, however this can change over time. With Buckeye Power becoming a member of the PJM Regional Transmission Organization (RTO), hot days in Ohio do not always correspond with the need to use peak management. Costs are allocated in two ways: The first is based on five days during the summer when the entire PJM system load is highest and the second is determined during the one hour of the year when the transmission utilities serving Buckeye’s members experience their peak demand. This simply means it may be cool and mild in Ohio, but if the east coast is experiencing high temperatures and humidity, it may be necessary to control. The radio-controlled switch (RCS) is a vital part of the load management program. Whenever there’s a risk of reaching a new peak, the water heater throughout the year, home heating in the winter or central air conditioning in the summer, RCSs are activated, temporarily interrupting electricity. Since the water in an electric water heater stays warm for several hours without power, most members will never notice the temporary shutdown. Home heating systems qualifying for load management have a back-up system to continue providing heat for the home. On the air conditioning units, it simply cycles the compressor of your cooling unit for brief periods of time - approximately 15 minutes in most cases. This does not control your thermostat or harm your cooling system. Cool air continues to circulate through your home. There is a $1/month discount applied to your bill for having a RCS on your water heater. If you have an RCS on your water heater and central air conditioning system, you may also be eligible for our Geothermal & Heat Pump Rate Discount. When switches are in use a red light illuminates on the RCS. 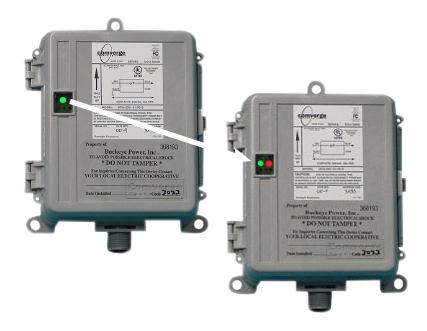 There is also a green light on the RCS, which should always be on to indicate there is power to the RCS.